This recipe is an adaptation of one in a vegan recipes my mother gifted me. 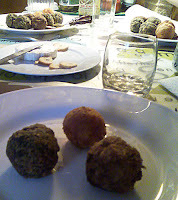 Vegetables balls are embarrassingly easy to cook, they can be freezed and permit multiple variations and sauces (see the “extras” section in this post), they are delicious all alone, with sauces, as garnish to meat, fish, eggs and even as dessert (see “alternatives” section to learn how to cook them with sweet potatoes) and are highly healthy and nourishing. Eat them hot! I will describe here how to make them at the microwave, but you can boil the vegetable instead. Wash and slice them into small pieces (specially the carrots, it takes longer to cook them) and put them in soup plates with water and into the microwave. Continue adding water from time to time when needed until you can mash them with a fork. Retire the water and mash them well. 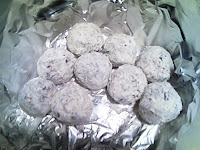 Add mashed potatoes powder and mix (the more the potatoes powder, the lighter the color of the balls). If the mixture gets too dry add a bit of water. Finally add the grated cheese and mix; it doesn’t matter if the cheese melts a bit. With two spoons and your hands roll balls and cover with flour. Fry them just before serving, with sunflower oil you will get a lighter taste. Substitute the emmental cheese for other, grated bread os don’t use any. You can employ pther vegetables, such as zucchini, leek, sweet potato (excellent as dessert served with maple syrup). Obviously, you can use boiled or roasted potatoes instead of potatoes powder, they will taste even better! You can insert in the heart of each ball a matching ingredient, for instance, a piece of roquefort to the spinach, boiled onions to the aubergine or. in case of the carrots and the sweet potato, a drop of maple syrup nearly freezed (to make it nearly solid).